Seasoned hikers wouldn’t dream of heading off into the wilderness without a map and a compass. But organizations do it every day. Two years after “In Search of Excellence” reported on 43 of the best run companies in America, 14 of the 43 firms were in financial trouble. The reason, according to a Business Week study: their failure to deal effectively with change. In other words, they lost their bearings. Every organization is perfectly aligned to get the results it’s getting. Unsatisfied with results? Check your map and compass. Strategic alignment is every bit as critical for organizations as it is for hikers. Call it pathfinding. 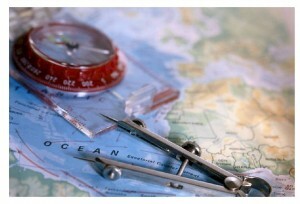 Call it navigating to true north. Call it mission and vision. Call it taking responsibility for shaping events. Call it good leadership. Call it smart business. Call it being change-friendly. It’s not a destination, it’s a journey. Take charge.